From its classical roots in complex analysis in the early twentieth century, Teichmuller theory has become deeply embedded in the structure of modern mathematics. 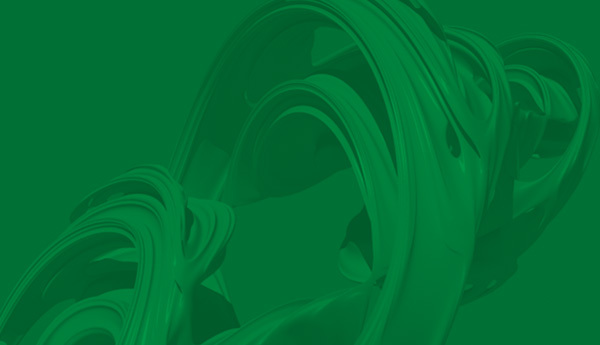 Its connections with many aspects of geometry, topology and dynamics are actively leading to new insights and advances both within Teichmuller theory and among its allied areas. Teichmuller space, which parameterizes the marked hyperbolic or conformal structures on a Riemann surface, admits an action by the Mapping Class Group of the surface, whose quotient is Riemann’s moduli space. These spaces admit a natural collection of metrics and flows. This definition, at the intersection of geometry, complex analysis, group actions and dynamics, lends itself to generalizations and analogies. These connect both the theorems and the techniques of Teichmuller theory to fields such as geometric group theory, dynamics of billiards, low dimensional topology, and the theory of homogeneous spaces. The dynamics of the Teichmuller geodesic flow, rational billiards and translation surfaces are interrelated. The Teichmuller flow acts on a space of translation surfaces (essentially a space of “billiard tables”) as a kind of renormalization of the billiard flow itself, hence relating mixing and equidistribution properties of the two types of dynamics. Moreover, Teichmuller flow extends to an action of SL(2,R) on this space that has a well developed analogy with homogeneous dynamics, leading to the recent breakthrough by Eskin-Mirzakhani-Mohammadi (EMM) establishing that SL(2, R)-orbit closures in the moduli space of translation surfaces are “affine.” This result provides a powerful tool for studying the dynamics of Teichmuller flows and billiard flows, and opens the door to many applications and further investigations. A full classification or list of SL(2,R)-orbit closures is only at its beginning, having been (largely) completed (previous to EMM) in genus 2 by McMullen with significant partial progress by Calta and with some recent progress, often using EMM, in genus 3. Building on the work of EMM, Filip used dynamics and Hodge theory to give a characterization of these orbit closures as algebraic varieties, strengthening the historic connection of the field to algebraic geometry. The geometry of Teichmuller space with the Teichmuller metric is tightly connected to its applications, and has also become a subject of inherent interest. After a strong foundation laid in the 50’s-70’s by Ahlfors, Bers, Royden, Masur and others, progress continues on understanding the metric and its symmetries. From the coarse point of view, a notable recent advance is the proof by Eskin-Masur-Rafi that Teichmuller space is quasi-isometrically rigid. Much current interest and activity is focused on finding effective constants and uniform (genus-independent) statements – most dramatically with the discovery, virtually simultaneously by several independent groups, of genus-independent bounds on the Masur-Minsky hyperbolicity theorem for the curve complex. Other metrics, particularly the Weil-Petersson metric and Thurston’s asym- metric (Lipschitz) metric, also arise naturally, and their geometry and dynamics have been the subject of much recent progress. Teichmuller theory has been one of the foundational ingredients of geometric group theory and these fields continue to enrich each other with questions and techniques. The geometric study of the mapping class group of a surface, beginning with the Nielsen-Thurston classification theory, has had a significant influence on the study of the group Out(Fn) of outer automorphisms of a free group, especially through the work of Bestvina, Feighn, Handel, Mosher, Culler and Vogtmann in the 1980’s. This area has recently taken a leap forward via the hyperbolicity theorems of Bestvina-Feighn and Handel-Mosher, which are direct analogues of the hyperbolicity theorem for the curve complex of a surface. This opens the way to further geometric study of Out(Fn), with the hope of building a geometric model for the group powerful enough to settle, for example, the question of quasi-isometric rigidity. Another productive open direction here is the question of generalizing these techniques still further to a broader class of groups with relative hyperbolicity properties. Teichmuller theory’s connections to the study of homogeneous spaces run deep, from the quasiconformal deformation theory of Ahlfors-Bers in the 1960’s and its connection to hyperbolic 3-manifolds, through Thurston’s program connecting 3-manifold theory to compactifications of Teichmuller space and classifications of mapping classes. Many aspects of Teichmuller theory generalize to the study of representation spaces into arbitrary target groups, and this area has recently seen much activity, due to the work of Goldman, Labourie, Wienhard and others. Work of Canary-Bridgeman-Labourie-Sambarino, building on work of Bridgeman and McMullen, has led to a definition of a “pressure metric” on deformation spaces of Anosov representations in higher rank, generalizing (one of the definitions of) the Weil-Petersson metric in Teichmuller space. Work of Goldman, Margulis, Labourie and others has connected aspects of Teichmuller theory to affine structures on open manifolds known as Margulis spacetimes. 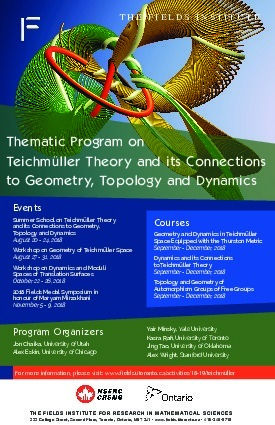 This program at the Fields will focus on the breadth of Teichmuller theory, from its historical roots to its many branches and interconnections with established and developing areas of mathematics. The introductory school will sample this breadth. 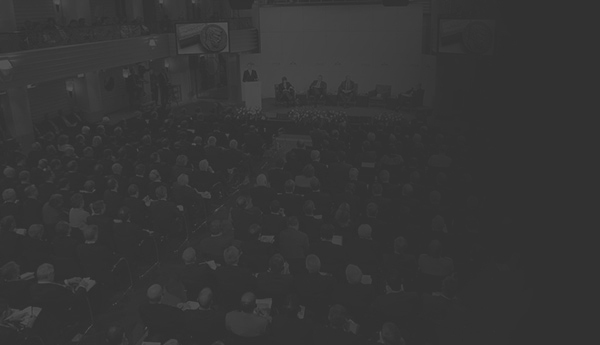 Specific streams and their particular connections will be highlighted in a series of workshops. Throughout the program, the different communities will interact, with care taken to provide support and mentoring for early-career mathematicians, opportunities for research at all levels, and outreach to the broader mathematical community.